Though Ramah in the Rockies is still young, it has already played cupid on a number of occasions! This Valentine’s day, we’re taking a look at three amazing Ramah in the Rockies couples, and the unique role that camp has played in their love stories. We wish everyone a day surrounded by love in all of its many forms! What role has Ramah in the Rockies played in your relationship? We have always been passionate about Ramah. We each grew up going to Ramah camps on separate coasts: Sarah at Ramah Darom and Dan at Ramah Ojai. Being able to share our passion for Ramah in the Rockies together is such a special part of our relationship. We love the energy at camp, coming up to visit, and watching our campers grow every year. What is your favorite camp memory as a couple? Why is camp such a special place to fall in love? We both agreed that if we could make it through a summer at camp, we could make it through anything. When we worked at camp together, we had only been dating for a couple of months, and there were some lows, but more importantly incredible highs. We got to know each other through a range of situations, all with a Jewish background. Lauren: We met at Rockies! I was in my final summer of rabbinical school, and I hadn’t yet “done my time” working at a Ramah camp as is required of JTS rabbinical students. I showed up on the first day of senior staff weekend as a total newbie, and I remember sitting in the Chadar Ochel (Dining Tent) in a circle, watching this curly-haired guy – Joel Dworkin – who had everyone in rapt attention and laughter. 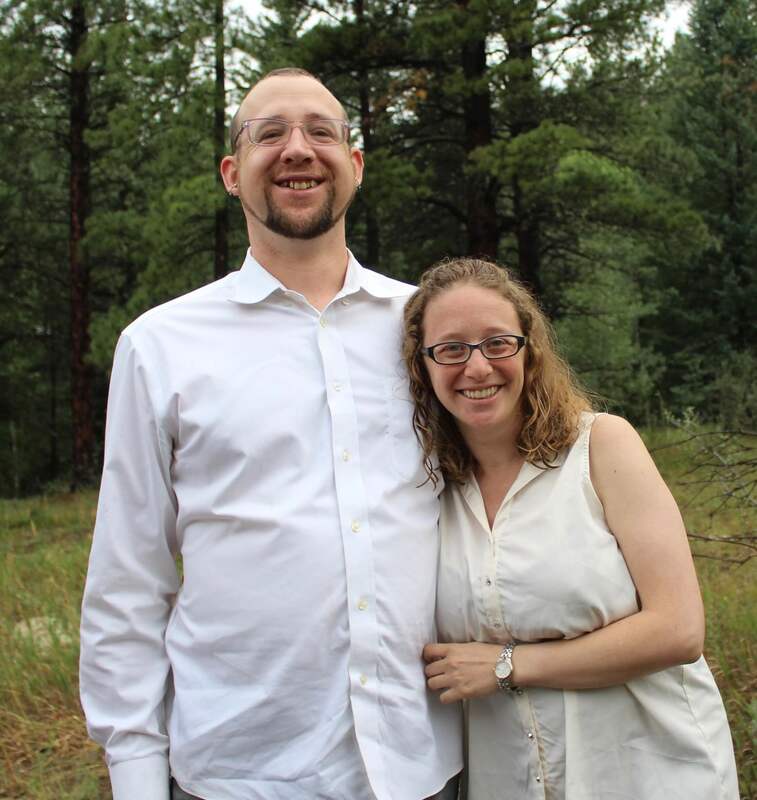 Joel: It was entirely by chance that I returned to work at Ramah in the Rockies in 2015. I had quit the previous summer after four years of building the masa (backcountry excursion) program and training the new Rosh Masa. In April, Eliav informed me that the new trips coordinator had gone AWOL. They asked if I would take my job back for a few more months… I agreed and when staff training began I was asked to help get a few people acquainted and moved into their tents for the summer. One of them was a young woman entering her last year of rabbinical school named Lauren Henderson. Our relationship was pretty secret from most people in camp for the first half of the summer, which we loved, and by mid-July, we started to talk about what would happen post-camp. I went back to finish rabbinical school, Joel went back to Denver, and a year later, we both moved to Chicago where I started my job working at Mishkan Chicago and Joel went back to school. We got engaged in April 2017, and we’ll be getting married this June right after Joel graduates! Ramah in the Rockies is the place we’ve kept coming back to, where we’re excited to celebrate this summer right after we get married, and where we hope to eventually send our future kids. Lauren: Early in the mornings before masa’ot (backcountry excursions) would go out, we would meet at the lodge. Joel would bring me an espresso that he’d made with his fancy espresso machine, and we’d sit together on the porch and watch the rest of the camp wake up. I loved those early, quiet mornings together, and I was so devastated when the building burned down – this was the memory from that building that I held onto the most. Lauren: I honestly believe that camp is the reason why we fell in love – it was the container that made the foundation of our relationship possible. 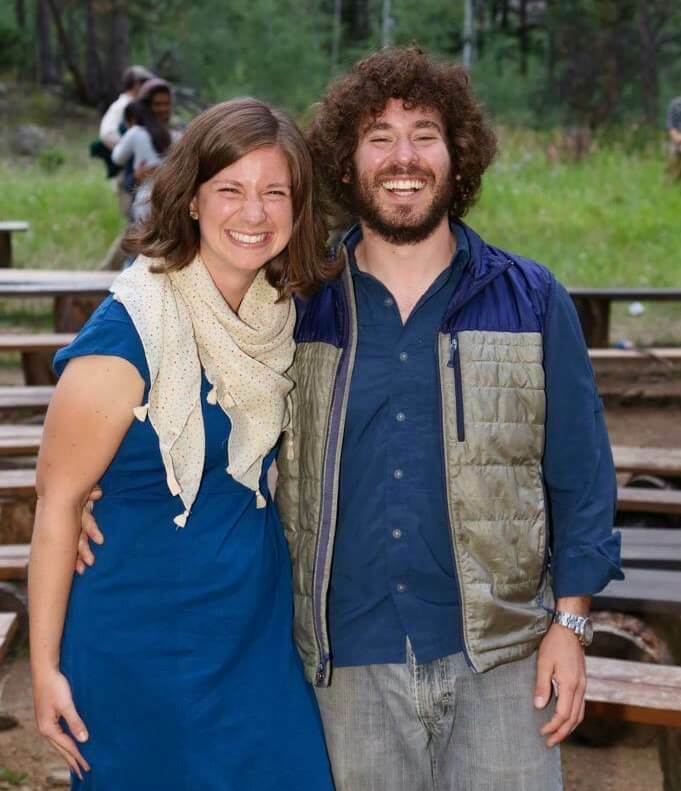 Joel and I were the best versions of ourselves at camp, personally and professionally, and we got to watch each other thrive in doing the kind of work we most enjoyed, me as a rabbi and him as a wilderness professional. I was the goofiest, silliest, no-makeup version of my rabbinic self, not having to put on a show for anyone. And Joel was the calm in the eye of the storm. Joel: Everything in camp happens in a bubble. Eliav often refers to shabbat as an island in time, referencing Abraham Joshua Heschel’s “palace in time.” I think of the entire summer as an island in time; the world shrinks to a few hundred people, every single day has enough going on to fill a week, and every week goes by so fast it seems like a day. There is no time to try to be who you think people want you to be at camp which makes it the norm to be genuine. I learned how empathic Lauren was when working with a homesick child and how she responded to stress before I ever knew her favorite color. I fell in love with who she was, and is, before I had a chance to deal with anything trivial. We met at camp, and our friendship really started to develop when Melannie came into the kitchen, where Jeffrey was the Head Chef, to help make malawach (a bread kneaded thoroughly with butter). Since then, camp has become an intentional community that we have chosen to return to year after year. It is a place where we know our thoughts and ideals meld with those around us. 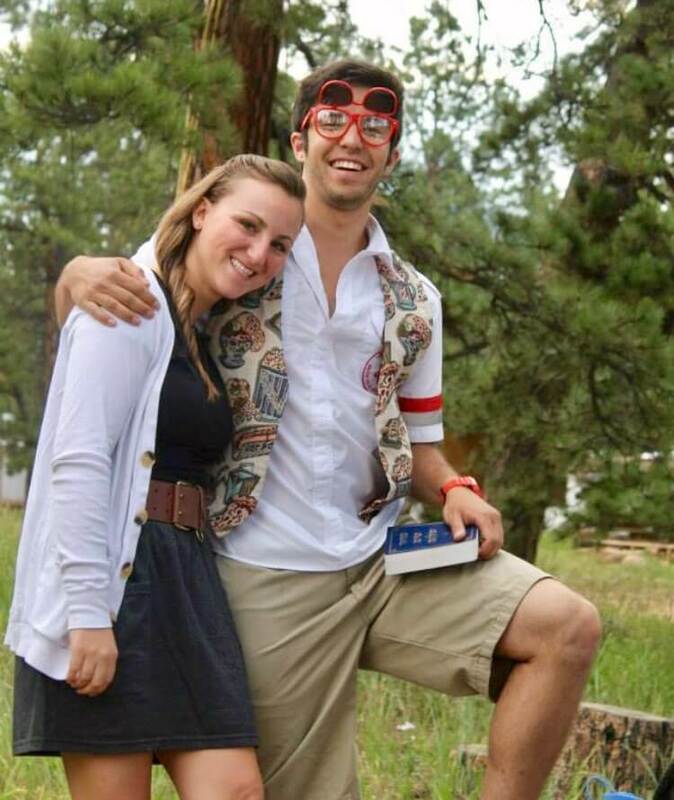 At Ramah in the Rockies, we have had the opportunity to develop relationships as a couple and to watch each other grow in an encouraging and amazing culture. A few weeks in to the summer, Jeffrey had decided he was going to propose to Melannie, and called Melannie’s parents to invite them to be there for the proposal. He spent the next month and a half planning out how he wanted to to it. Jeffrey decided that on August 12th, he would take Melannie on a walk and present a book with a momento from every date or outing we had ever been on. Rosh Susim, Chelsea Schwab, had signed on as Jeffrey’s secret agent with the mission of finding out Melannie’s ring size – a goal she pulled of with ninja-like smoothness. Office Manager Lisa Holstein hid the engagement ring in the safe and Jeffrey stored the handmade book in his office. But on August 7th, when the fire destroyed the Lodge building, the book and the ring were gone – just days before the proposal. While Jeffrey scrambled to order a new ring, Ranch Manager Jake Schwab and Ben Hall spent hours searching through the rubble. Miraculously, they managed to find the ring – blackened by the smoke but still as beautiful as ever! While the proposal was pretty much nothing like Jeffrey had planned, it was still incredible. We are so happy that it happened while we were surrounded by the community that brought us together! Because it is an intentional community where you live and work alongside each other – an experience that can be very intense. At camp, you often get to see the best and worst of people, creating bonds and a sense of understanding that would usually take much longer to develop.